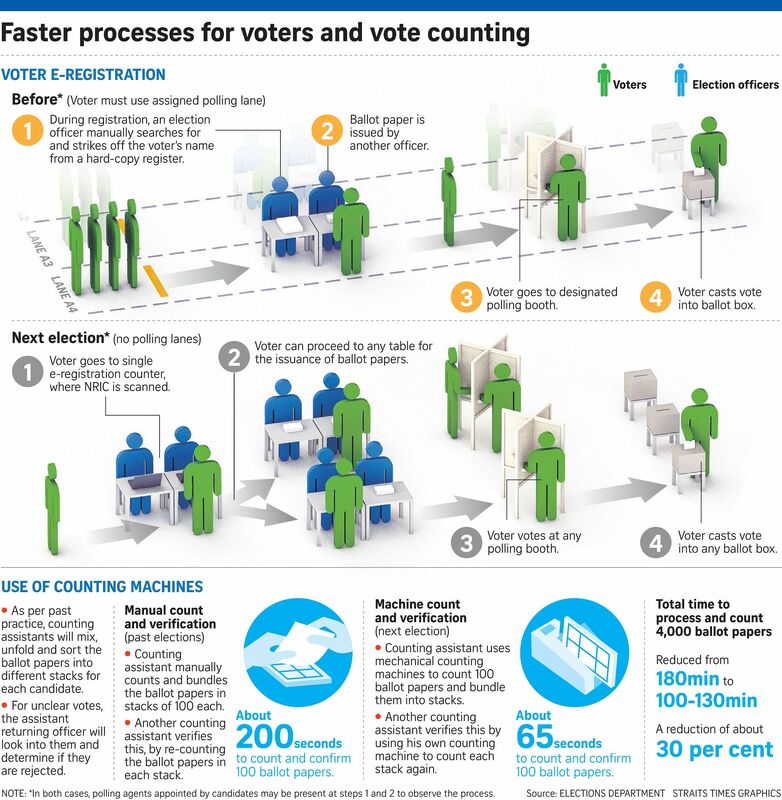 Voters at the next election in Singapore can register electronically at polling stations, and their votes will be tallied by counting machines. These new initiatives will help to improve the election process and give voters a smoother experience at polling stations, the Elections Department (ELD) said yesterday. However, hardcopy ballot papers will continue to be used, and counting assistants will still handle the mixing, unfolding and sorting of the papers, it added. Also, the Assistant Returning Officer will still be responsible for looking through unclear votes and deciding if they are to be rejected. The ELD said counting will be three times faster with the use of the counting machines. Polling results, in turn, can be ready about an hour earlier than in past elections. The counting machines are similar to those used to handle banknotes and will not be connected to the Internet. These devices will be battery-powered. Without these machines, it takes about 200 seconds to count and confirm 100 ballot papers, the ELD said. The process involves a manual count by one counting assistant, with another verifying the number. With the counting machines, it takes about 65 seconds as the first counting assistant takes a pile of sorted ballot papers for the machine to count 100 of them. This pile of 100 is then passed to a second counting assistant for verification using a separate counting machine. As each polling station has an average of about 4,000 voters, the total time for processing and counting 4,000 ballot papers - including mixing, unfolding and sorting - is reduced from 180 minutes to between 100 and 130 minutes. This reduces the time taken by about 30 per cent, with the time saved ranging between 50 and 80 minutes, the ELD said. To ascertain the accuracy of the counting machines, a check will be performed before vote counting starts, and candidates and appointed counting agents can witness this test. The test will be done with specimen ballot papers. Another improvement is the shorter wait at polling stations following e-registration. Voters will scan their NRICs in a similar manner to how registration is done at polyclinics. The existing process requires election officers to manually search for a voter's name in a hardcopy register and strike it off. With this change, the layout of the polling station will be re-designed as voters do not have to go to designated lanes to register. They can approach any one of two e-registration counters at each polling station. After that, they can go to any available counter to get their ballot paper, cast their vote at any unoccupied polling booth and place it in any ballot box. To prepare for the next general election, which must be called by January 2021, the ELD will call an open tender later this month for the voter e-registration system. This tender is expected to be awarded by the first quarter of next year. For the counting machines, the ELD may leverage an existing lo-gistics contract and lease up to 2,700 of them. The plan is to have the machines delivered in the third quarter of next year for the ELD to show them to the political parties. In the run-up to the next general election, the ELD said it will also call other tenders in the coming months, like bus transport services to ferry election officials.